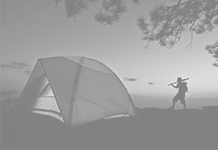 Camping lanterns are an essential source of light during camping trips. 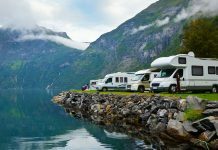 When the need arises, they can provide light at home or when outdoors. 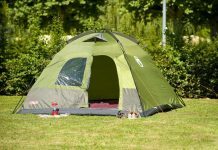 There are many different types of camping lights available. 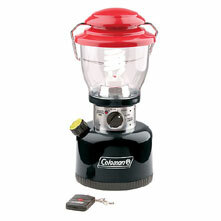 One can pick from rechargeable, gas run, wind and go, battery operated and even flameless lanterns. 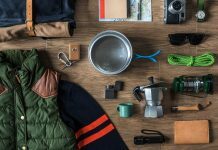 Here are top 12 camping lanterns for the next camping trip. 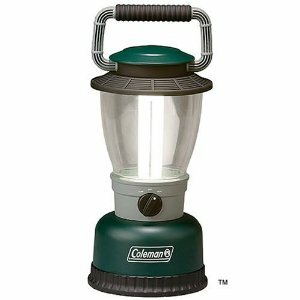 This is an industrial duty lantern that comes along with a no excuse warranty. The battery can be recharged up to 500 times and each full recharge provides for 3.5 hours of 80000-peak bean candlepower. It is waterproof and is almost indestructible. 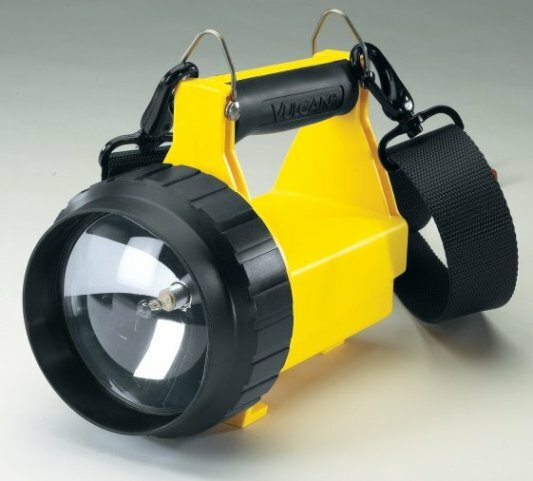 The lantern comes along with a 120 V AC battery and 12 V DC cords, shoulder strap and a mounting rack. Green and red LEDs indicate the charge status. The grip handle is comfortable with a rubberized cushion. 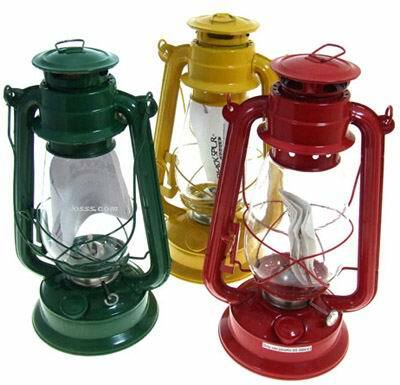 This lantern is a useful device to have around a camping ground and in homes too. It can be recharged in three different ways. It can be solar charged with the two flip-open panels provided at the back or 12 v auto adapter or an AC home adapter. 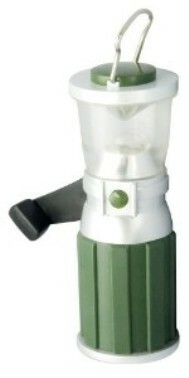 It has a 9-watt CFL U tube that gives light for up to 12 hours on low setting. It requires 17-18 hours of recharging. The AM/FM radio is good entertainment and the lantern can be used as an emergency light at home. 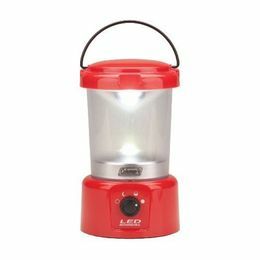 This is a super bright family sized camping lantern. It can be operated from a distance of up to 40’ when using the remote transmitter. It has a powerful 15 watt Spiral U tube for bright, white light. It also has a nightlight that can operate for almost 30 hours on low. The lantern uses D cell batteries. 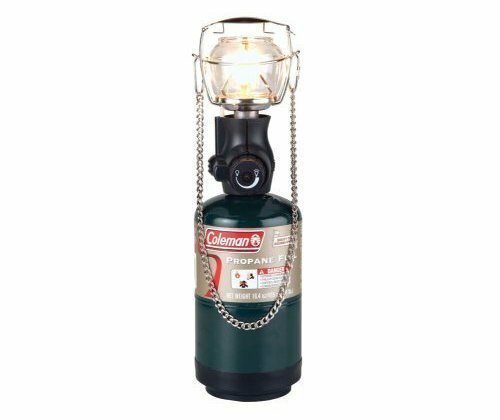 Here is a lightweight and compact gas lantern. Sans the gas canister, it weighs less than half a pound. It is compact enough to fit into the palm of a grown up. The light is very bright and can be adjusted. The canister can last really long when the light is low. It works with valve cartridges of CV470 or CV270. A wire guard is provided to keep the globe safe. This is a great energy saver. It does not have a battery and needs no recharging either. It works the old-fashioned way cranking by hand. For every minute of cranking, it produces light for a whole hour. It comes with a carbineer and can be hung anywhere leaving both hands free. The small sized wonder (6.5” high) is compact and easy to carry. Small, lightweight, easy to carry and needs no battery… it can’t really get better than this. This lantern is perfect for the individuals with its bright white LEDs. It has five 5mm LEDs with an output of 40 lumens. Once charged it provides light for up to 12 hours. The lantern has a textured globe to give a perfect beam pattern. The light can be set on high or low as required. The lantern is weather resistant. It comes along with a 120v AC adapter. The entire unit weighs only 7.4 ounces and is about 10” high. 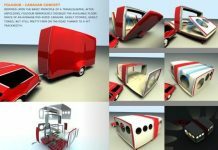 It uses innovative lighting technology. It is powered with Cree Xlamp XR-E LED. The LEDs provide 190 lumens of bright light and can run for 25 hours. It uses a 4D battery pack for power. It is compact with a height of 10.2” and width of 5.1”. 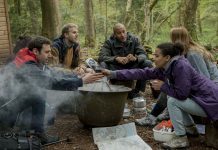 It is the perfect companion for camping trips. With 25 hours for a 4D pack, it does not guzzle on batteries either. 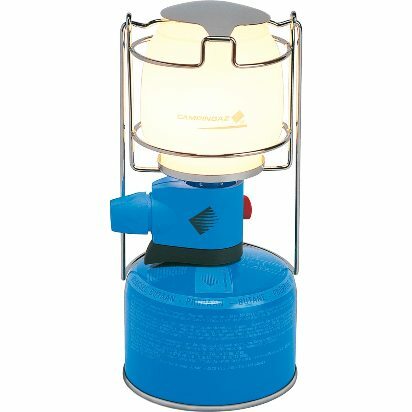 Here is the traditional kerosene lantern. It is inexpensive and about a foot high. It is made of strong metal and is a bold red in color. The glass globe is guarded with metal wires for extra protection. It has an adjustable wick to provide light as required. This can be recharged using the solar panels provided at the back, with the help of a 12-v auto adapter or with a 120v AC home adapter. The light can be adjusted to high or low. Eight hours in the sun will charge it enough to last for three hours on high and longer on low. When fully charged it runs for 8-12 hours. A full charge would mean 30 hours of bright sunlight or 18-20 hours with any of the adapters. 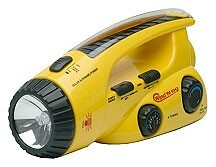 It comes with a sealed lead battery and can operate as an emergency light when hooked on to a power outlet at home. 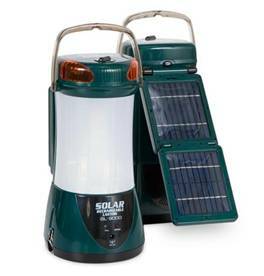 This is a multipurpose camping lantern that can be powered by solar cells, wind-up dynamo, ac/dc charger (included) or 3C sized batteries (not included). So even if you forget to charge it you can always crank it up. It can be converted from a LED flashlight to a lantern by pulling the lens. It is powered by three LEDs and has an inbuilt radio to keep you entertained and informed. It also has emergency features like a siren and flashing beacon. 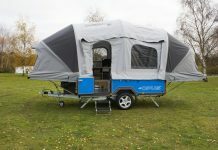 It is perfect for camping trips and also for service and emergency professionals. 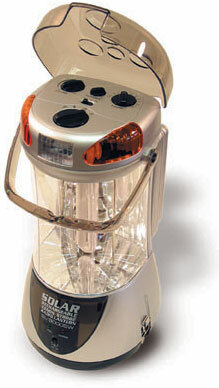 A fully charged lantern will provide light and radio for 6 hours. Every three minutes of winding provides power for half an hour of light and radio. The 3C batteries last for 20 hours. 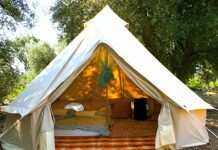 It is equipped with a chain handle for hanging or carrying. The light output can be adjusted and will provide consistent lighting irrespective of weather. 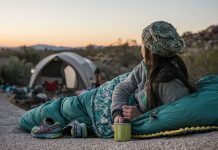 It uses a single 16.4-ounce Coleman propane cylinder for 12 hours of light. It is the perfect combination of original candle lantern and LED lights. The candle uses propane gas and the LEDs use battery. The Battery powered LED can be carried separately too. 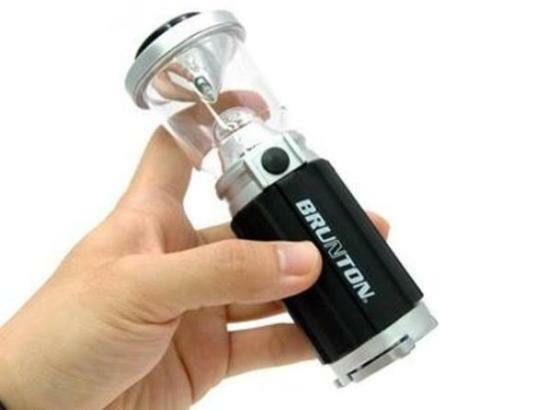 In spite of its size this small LED lantern is easy to carry when backpacking, boating or camping. It can also double as an emergency light. One can choose a low or high light setting and it runs on AA batteries that are not included. It can also use a set of 4 batteries to run for 250 hours when set on low.